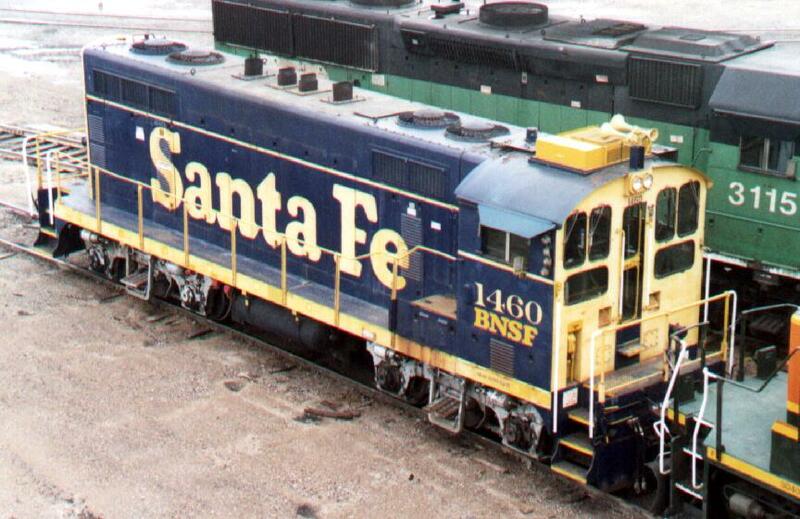 Santa Fe's #1460, affectionately known to rail fans as the "Beep," works the railroad's Argentine yard sometime prior to the 1995 BNSF merger. The "Beep" (also referred to as the SWBLW) is a one-of-a-kind switcher locomotive built in 1970 by the Atchison, Topeka and Santa Fe Railway at the company's Cleburne, Texas workshops. Technically a rebuild, the "Beep" (a portmanteau of "Baldwin Geep," whose official designation was derived from "SWitcher, Baldwin Locomotive Works") originally entered service on the Santa Fe as a Baldwin Model VO-1000. Following close on the heels of its highly-successful CF7 capital rebuilding program, the company hoped to determine whether or not re-manufacturing its aging, non-EMD end cab switchers by fitting them with new EMD prime movers was an economically viable proposition. In the end, the conversion procedure proved too costly and only the one unit was modified. The unit was removed from active service in 2008 and donated to the Western America Railroad Museum in Barstow, California the following year. In the early 1960s the Reading Company sent 14 of their VO-1000s to General Motors Electro-Motive Division to have them rebuilt to SW900 specifications. Unlike the "Beep," however, these locomotives retained most of their original car bodies. The units were subsequently given the designation VO-1000m. 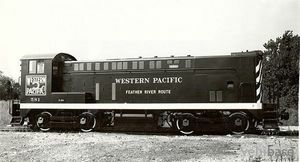 In its original incarnation, the "Beep" bore close resemblance to Western Pacific Railroad #581, a Baldwin VO-1000 seen here in a September, 1945 builder's photo. Santa Fe's retired "Beep" on static display at the Western America Railroad Museum in Barstow, California. VO-1000 No. 67729 emerged from the Baldwin Locomotive Works Eddystone, Pennsylvania facility in July, 1943 dressed in the Santa Fe "Zebra Stripe" livery and bearing #2220. 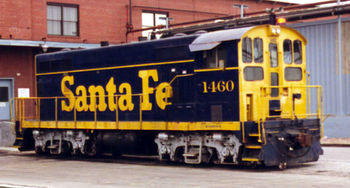 In the early 1960s the unit would take on the blue and yellow "Billboard" paint scheme with "SANTA FE" displayed in small yellow letters above the accent stripe, as was the standard for all yard switchers. It is these colors that #2220 displayed when it was selected as a test subject. Much as with the CF7 conversions, the unit was stripped down to its bare frame, and the long hood, 1,000-horsepower (746-kilowatt) power plant, trucks, control gear, and electrical system scrapped; only the Baldwin cab remained. Mirroring the very first CF7 modification, the long hood and walkways from a decommissioned GP7 was fitted to the Baldwin's cast steel frame, which (as it turned out) required a considerable amount of modification. The locomotive was configured in an AAR B-B wheel arrangement and mounted atop two Blomberg B two-axle trucks, with all axles powered. A sixteen-cylinder, 1,500-horsepower (1,119 kilowatt) EMD 567 series diesel engine, salvaged from a retired EMD F-unit, was installed and fitted with a two-stack exhaust manifold. Additionally, the unit received a state-of-the-art electrical system. The completed "Beep" rolled out of the Cleburne shops in December of 1970 (with one of its original Baldwin builder's plates still affixed) sporting fresh blue and yellow paint, though now the words "Santa Fe" were applied in yellow in a large serif font (logotype) along the sides below the accent stripe in the style otherwise reserved for road switchers and other main line locomotives. It was also assigned #2450 (the first CF7 was given #2649, with successive numbers applied in descending order) and placed in service in south Texas. Train crews favored #2450 due to the superior riding qualities of its Blomberg trucks, which ran more smoothly than the original Association of American Railroads (AAR) Type-A switcher trucks; being several tons heavier than a typical GP7 imparted a higher tractive effort which was helpful when switching long cuts of cars. The Beep spent many years in lease service performing switching duties for the Port Terminal Railroad Association in Houston. In August, 1974 the unit was re-designated as #1160 as part of a general locomotive renumbering scheme. It was again renumbered along with the Santa Fe's few remaining EMD switchers and assigned #1460 in January, 1977. The "Beep" was transferred to Cleburne as the shop switcher in the mid-1980s, where in 1985 it was given a number of external modifications. A cab air conditioning system was added, and the rear cab windows were modified from their original Baldwin pattern to a new three-pane configuration that accommodated the use of standard window glass sizes common to many EMD locomotives. The unit was given fresh paint (the "Billboard" colors were maintained) and placed back in service. 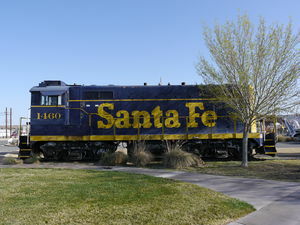 SW900 #1453, the Santa Fe's last "standard" EMD switcher, was retired in 1987, thereby making #1460 the only remaining end cab switcher on the roster. The Beep continued its work at Cleburne until the shops were closed later that year. Thereafter, the unit worked as a shop switcher at both the Argentine shops in Kansas City and in Topeka, Kansas. The locomotive was equipped with remote control equipment (RCE) in the early 1990s so that it could be operated from a distance. As part of the modifications a set of colored lights was affixed to side of the cab; the lights were subsequently removed in 2007. After the Santa Fe merged with the Burlington Northern Railroad in 1995 to form the BNSF Railway, the Beep was one of only three blue and yellow units not affected by the new company's sweeping renumbering program. #1460's cab sides were affixed with a BNSF sub-lettering "patch" and retrofitted with a four-stack exhaust manifold. The locomotive's 38-year term of service made it without question the longest-lived Santa Fe rebuild then active in the BNSF system. #1460 was also the last re-powered Baldwin active on a Class I railroad (though some re-powered Baldwins continue to work for short lines and the military). The unit was taken out of service in December 2008. It left Topeka on May 14, 2009 headed for the Western America Railroad Museum in Barstow, California, where it currently resides as part of the museum's motive power collection. ↑ Santa Fe had designated a handful of other non-EMD switcher locomotives for rebuilding around 1970 (including two Fairbanks-Morse H-10-44s), but all of these units were subsequently scrapped when it was determined that the required modifications were not cost-effective. This page was last modified 04:35, 25 August 2013.